After my first film Glickman aired on HBO, I did a lot of research looking for my next documentary subject. One day I came across an article about how in the early 1900s this little German-American immigrant, Carl Laemmle, had taken on Thomas Edison’s monopolistic Film Trust. This “David vs. Goliath” battle, which Laemmle ultimately won, determined the future of the film business. Then I read another article about Laemmle which explained how he founded Universal Studios and led the immigration of filmmakers to Hollywood. Another article revealed how Laemmle hired many women directors (in stark contrast to studio practices today). Yet another article told how Laemmle fought Hollywood censors to make Imitation of Life, a film about being black in America in the 1930s. Article after article revealed Carl Laemmle’s extraordinary vision and accomplishments — yet when I would tell people about this amazing man, hardly anyone had heard of him. However, it was what I read about Carl after he sold Universal in 1936 that really inspired me. In the last years of his life, Carl Laemmle spent most of his time and fortune rescuing Jewish refugee families from Nazi Germany. To do this he not only had to fight the Nazis but an anti-Semitic U.S. State Department that didn’t want any more those “refugees” coming to America. The parallels to our U.S. government’s anti-immigration policies of today were striking. With so much divisiveness in our country these days, I thought what better time to make a film about an immigrant who helped make America great. Finding the people Carl Laemmle saved and interviewing them. I also was fortunate to find archival interviews with other people Carl rescued through the Shoah Foundation. 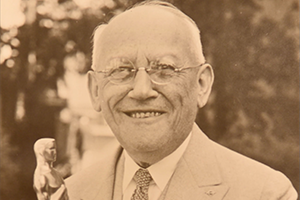 Carl Laemmle cared about humanity and overcame great obstacles to help those less fortunate. Hopefully, by watching his remarkable life story, people will be inspired to do the same. Our government resides in Washington D.C. I’d love it if some of our elected officials watched the film — especially the ones I don’t agree with politically. What films, filmmakers, or artists have been the most influential to you? There are way too many to mention but here are three: Billy Wilder. Robert Rauschenberg. The Beatles. Many people have never met a Jewish person. Perhaps by seeing our films they will come away with a positive view of our people. Watch Carl Laemmle during the 2019 JxJ.